'Stay Free' was the lead single from Ashford & Simpson's 1979 LP of the same name, a truly all-star album that included a who's who of Disco and Soul session luminaries within it's production credits including Jimmy Simpson, John Davis, Eric Gale, Ralph MacDonald and many more. This was the era of big major label Disco productions when there was huge budgets for the best studios, musicians and engineers. All of these factors teamed with the phenomenal song-writing and vocal performances of Nickolas Ashford and Valerie Simpson meant that 'Stay Free' would go gold on it's release and give the duo some of their most enduring songs including said title track and the anthemic gospel Disco classic 'Found a cure'. To have access and the permission to remix such classic records is a real honour, one that Dimitri does not take lightly, suffice to say then that the mixes you hold here in your hands are the very best, they've been put through the quality control channels, road-tested and listened to over and over before reaching you. A lifetime spent passionately in love with Disco and club culture has given Dimitri the correct perspective to present these future classic remixes to you and this is evident upon listening. Across 4 different versions we are treated to all of the wondrous elements that make up the Ashford & Simpson sound, the lush orchestration, the heavenly arrangements, mid-tempo, sultry grooves and of course, the absolutely top shelf vocal performances of what is surely, one of the greatest duos in the history of Disco and Soul music, steeped in wisdom, love and deepness it's no surprise that every single track here delivers - and then some. 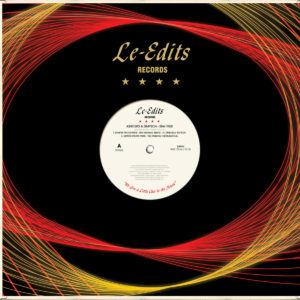 Simply put, only the finest Disco reworks are released on Le Edits. Special versions of classics and rarer than rare tracks, all lovingly re-touched and mixed from the reels and master tapes each time, fully sanctioned and created in conjunction with the artists, rights holders and Above Board Distribution. 100% official and essential. This is no 'under the counter' operation, Le Edit is here to bring back some quality and class to the re-edit game by doing things, once and for all, properly and respectfully. No re-press guaranteed. Utilising the highest end tip-on heavy duty sleeves, and outer protective sleeves, pressed onto 100% virgin vinyl. These new mixes have been legitimately commissioned and will not be available digitally. This product cost 4 times as much to produce than your average Disco edit 12’’ because Le Edits believe in quality first and foremost. You really haven't heard these tracks like this before! A truly collectible and desirable item indeed.